Recovering of the electron—phonon interaction (EPI) function for metals is the most attractive and impressive side of PCS. 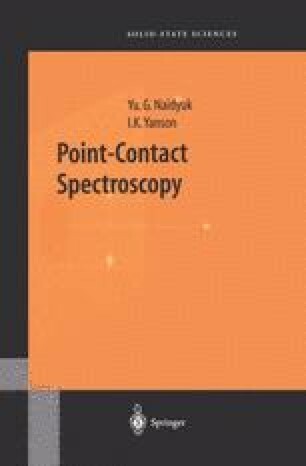 Direct proportionality between the second derivative of the I – V characteristic and the EPI function admits to using point contact as a spectroscopic instrument that develops point-contact spectroscopy in a new kind of solid-state spectroscopy. In this chapter, we are going to survey the study of EPI in metals1 with different crystal structure, topology of the Fermi surface, exhibiting of ferro- or antiferromagnetic order as well as related topics concerning electron—magnon interaction, localized phonon vibrations, influence of boundary between metals on the transport processes in contact, study of EPI in compounds and so on.